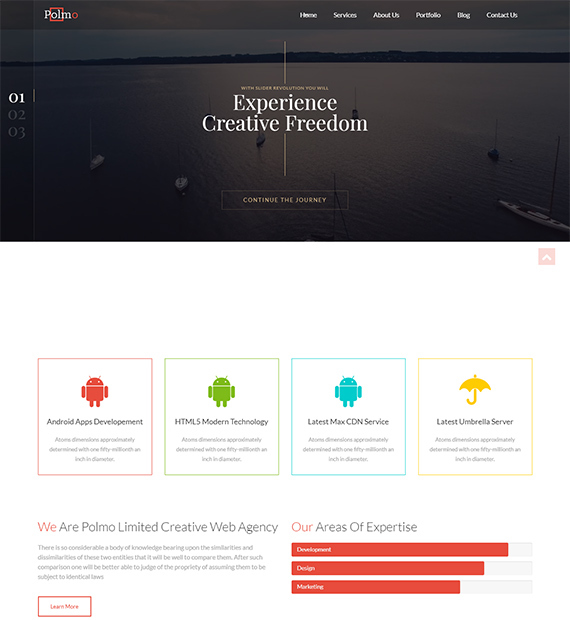 Another great theme by Liton Arefin, Polmo lite is a multipurpose WordPress theme that you can use for any type of site. The One Page layout of the theme makes your site appealing and effective for your users to access. Perfect for business, agency, personal, parallax and portfolio site, Polmo lite is a theme featuring clean, sleek and modern design outlet. The responsive and retina ready design adds the extra touch of professioalism you were looking for! Redirect your clients and followers straight to the target page without having them to visit other pages of your site with the simple one page design. Add the element of 2D with the parallax effect where background element scrolls slower than foreground content making the scrolling transition look appealing. Instantly load the contents in a page using the integrated AJAX pagination without having to reload the page again. Enjoy the enhanced responsiveness on your WordPress site! Improve the performance of your site with Lazy Loading. Speed up and save your user’s bandwidth by loading images on websites asynchronously. Compatible with all the popular WordPress slider plugins. Create amazing and responsive sliders on your website in no time by including infinite number of preferred images. Navigate easier! Integrate effective and functional sticky header and navigators that stays put even when the users scroll down through your website.